The Minister for Foreign Affairs and Immigration, Hon Rimbink Pato attended the Third Ministerial Review Meeting (MIM3) of the Pacific Island Leaders Meeting (PALM), which was held in Tokyo from 17-18 January, 2016. As the Leader of the Papua New Guinea delegation, Minister Pato expressed satisfaction on the outcome of the Meeting (MIM3), which was co-chaired by Mr Fumio Kishida, Minister for Foreign Affairs of Japan and Mr Lorin Robert, Secretary for Foreign Affairs of the Federated States of Micronesia. Participants of the MIM3 included all other Forum Island Country leaders and Ministers. The outcome of the meeting reflected Japan’s deep understanding and commitment on the ongoing partnership and support to Pacific Island Countries on the challenges of disaster risk management, climate change, infrastructure development and educational aspirations of the Pacific Islands peoples, among other interests of the region. Minister Pato is grateful for Japan’s commitment to continue supporting the Forum Island Countries through the PALM process. The Meeting received with satisfaction a progress report from the Japanese side regarding the implementation and targeting of the use of 55 billion yen pledged at the Fukushima PALM 7 Summit in 2015, which has been disbursed for various projects throughout the Pacific Islands for human resource development, people-to-people exchanges, climate change, disaster risk reduction, environmental conservation and sustainability projects, maritime issues, fisheries, trade, investment and tourism programmes”. The Meeting also confirmed the date and venue of the PALM 8 which is scheduled to take place in Iwaki City, Fukushima Prefecture from 18-19 May 2018. Furthermore, the Meeting also agreed through the Chair’s Summary for cooperation with Japan to continue through the PALM process, as well as pursue cooperation on global initiatives for environmental sustainability, climate change, freedom of navigation, security of maritime borders, and supporting the United Nations Security Council reform process, including other multilateral initiatives for economic, social and health development programmes in the Pacific. On the margins of the meeting, Foreign Minister Pato held warm and friendly meetings with Prime Minister Abe, through the group visit to his office where Foreign Minister Pato extended Prime Minister O’Neill’s greetings and highlighted the significance and importance of the range of issues currently being pursued by both Papua New Guinea and Japan at a bilateral level. A bilateral Meeting between Foreign Minister Pato and Japan’s Foreign Minister Mr Fumio Kishida including Vice Minister for Foreign Affairs Mr Kiyoshi Odawara was also held in which the same issues were highlighted. 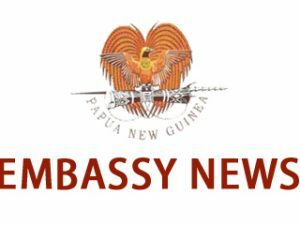 These include among others, agreement to continue the APEC 2018 support programme, the Japanese war dead bone collection programme, JICA support for technical cooperation, proposal for a double tax avoidance treaty, reciprocal visa arrangements for other categories other than the now-implemented visa free entry to either country by Papua New Guinea officials and diplomatic passport holders, such as research, bone collection, sports and business.